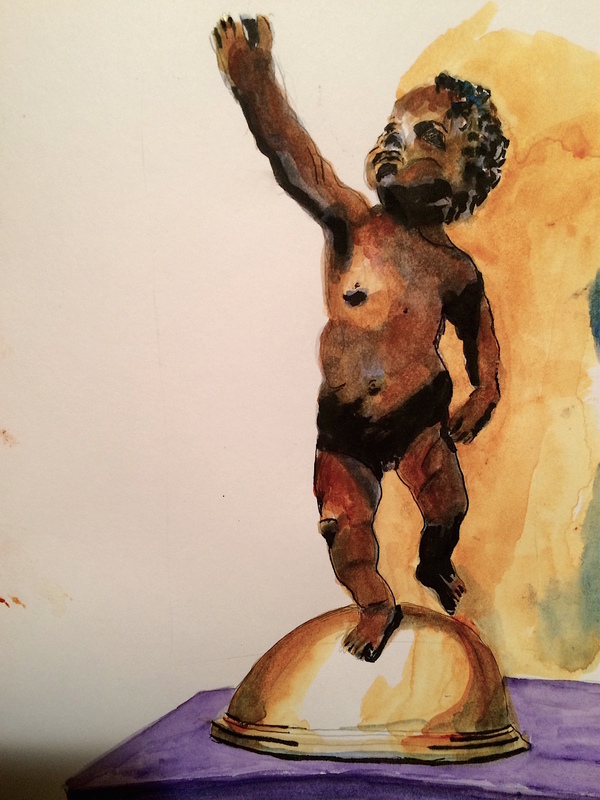 A sculpture called “Putto Poised on a Globe”in the National Gallery seems to evoke our times even though it is over 500 years old. 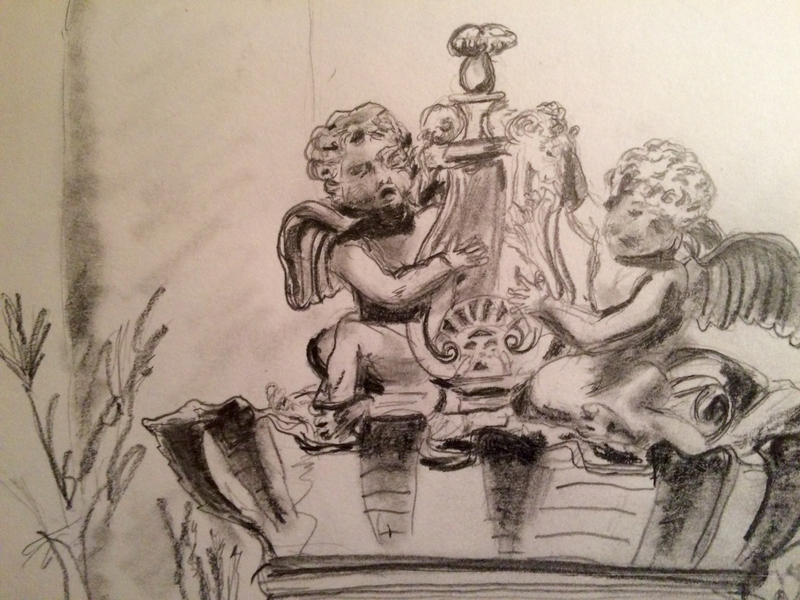 A “putto” (per Wikipedia) is a toddler boy, not a cherub. This sculpture, however, –made of “unbaked clay”– has survived more than half a millennium without damage. 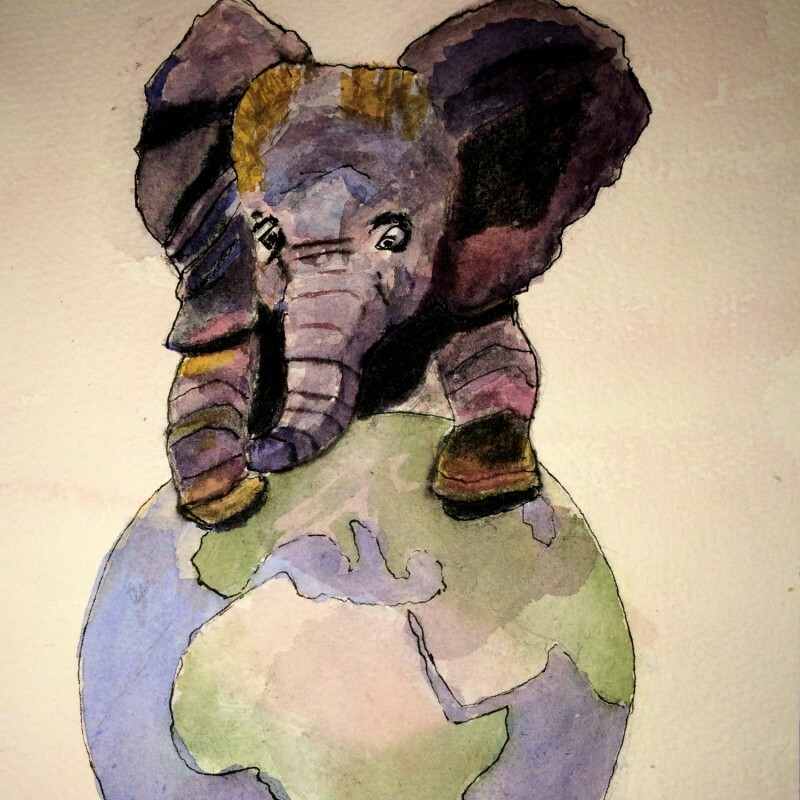 Illustration: Watercolor and ink sketch on mixed media paper by Black Elephant Blog author… of “Putto Poised on a Globe” sculpture (c. 1480) in the National Gallery of Art, Washington, D.C.
It’s been a busy month so far with lots of historic things happening and unforgettable visual images of comings and goings, tears and fears, important ideas and corporate disasters (VW, for instance)…which merit deeper consideration, perhaps together, on this blog, but for now…there’s still time to keep pressing forward with color schemes. Before visiting a friend today whom I have not seen in many, many years, I picked up some flowers… for her…and some for me. 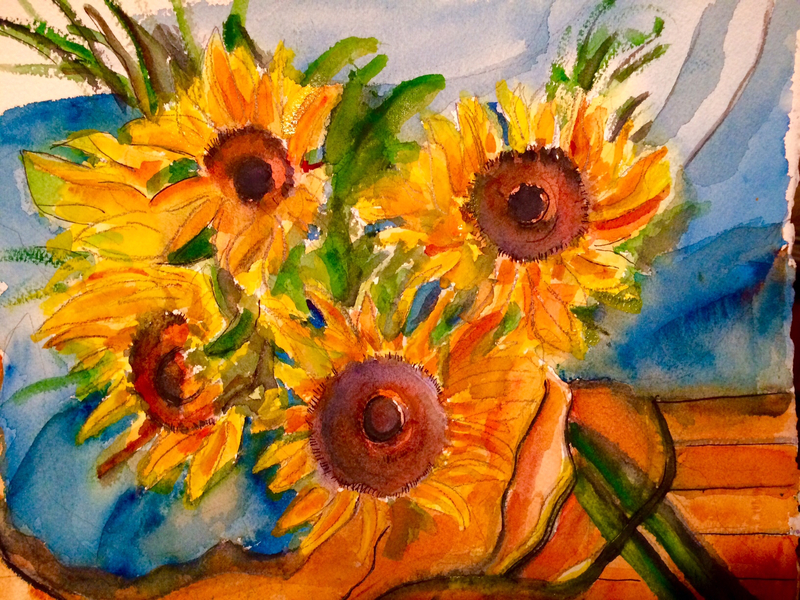 After a most remarkable visit, I took a stab at painting the bunch of flowers I’d kept. When a conversation occurs between two people who last saw each other more than 30 years ago (! ), on an open rooftop overlooking a capital city in all directions, it’s clear: this day was an historic happening all on its own. 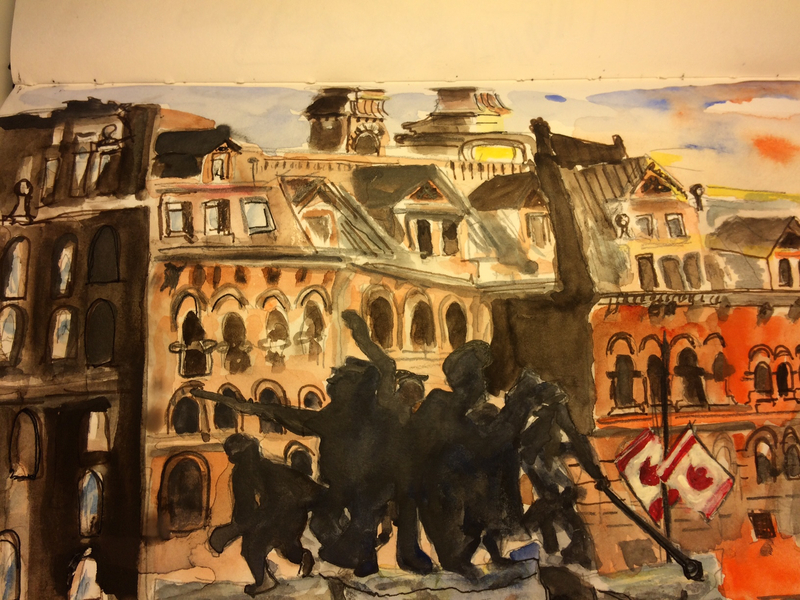 Last week, an unusually good workshop on “Climate, Defense, and Security” occurred in downtown Ottawa sponsored by the Canadian Defense Association. The purpose of the workshop was to assess the security risks or threats of climate change impacts. The speakers and the audience deftly covered a wide range of relevant, forward-looking themes in the half-day allotted to the workshop. We are facing “governance issues.” There is “virtually no leadership” on these issues. Defense agencies can be very much part of the solution, if they can be engaged in reducing fuel consumption. Since the Industrial Revolution, we have now pierced through what has been the highest level of CO2 emissions [ever]: We are going into a place where we haven’t been in 400,000 years. The processes of climate science consistently underestimate the rate and scale of these changes. “It’s not just what has to be done but who has to do it.” There must be “mini-lateralism” in addition to multilateralism. Ottawa itself looked its best in the bright September sunlight, a wonderful gift for those with some time to walk around. I wondered if the workshop signaled some sort of shift in the climate around the issue of climate change. The last time I was in Ottawa in September was on 9-11-2001 when the geostrategic climate suddenly changed dramatically, in ways we are still living with today. On the visit this week, the weather was seemingly similar to the day I recall with such heaviness 14 years ago: brilliant blue skies and buildings gleaming in the sunshine. 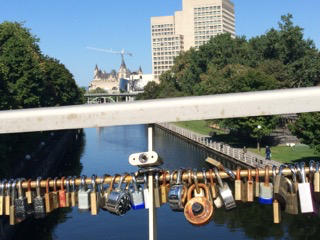 It was a real pleasure to be able at last to stroll around the city and take in the many gorgeous sights, from the locks along the canal (of both varieties: canal locks and locks locked to the railings of a pedestrian bridge over the Rideau Canal) to sculptures, fountains, the Byward Market, and an independent bookstore (they still exist!) on Eglin Street. 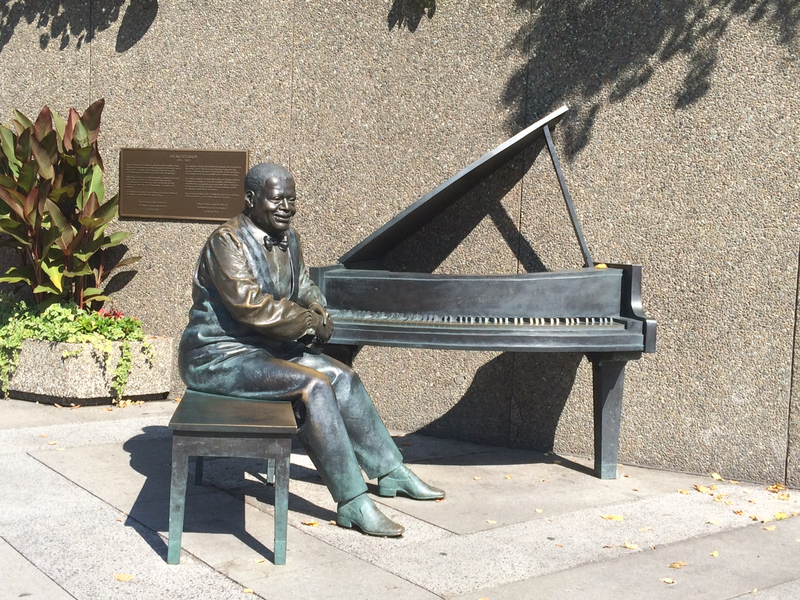 Some of the sculptures brought me to a standstill, including the one of Canadian jazz legend Oscar Peterson on a corner next to the National Arts Center, where the sound of his piano playing (coming from speakers around the sculpture) soothes your nerves while you’re waiting to cross the street. Despite all the sights competing for my attention, I managed to get a few sketches started while exploring, adding color later. It remains to do be seen what will be done about the climate challenges identified at the workshop, and by whom. Given the shortcomings of traditional approaches highlighted in the workshop, some innovations in governance, science, and diplomacy seem necessary to cope with the novelties involved in understanding the risks and threats related to climate change impacts. It’s back to school, right into the weekend, in an intensive art workshop with an accomplished artist and art historian as our excellent teacher. People have come from far-flung places, even Canada, for this class, including the instructor. 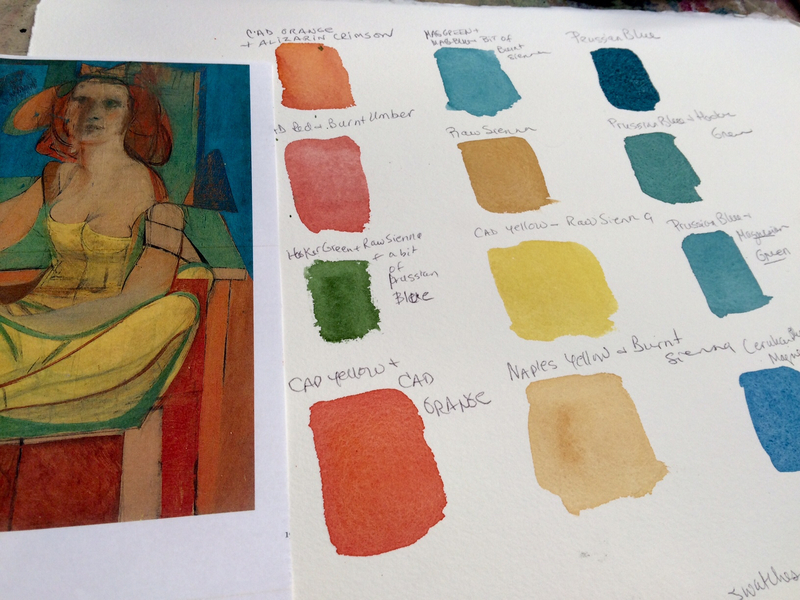 We have poured through the works of the “masters,” including a rare original sketchbook of Cezanne’s. We traversed through some highlights from about 600 years of art history in the National Gallery one day. 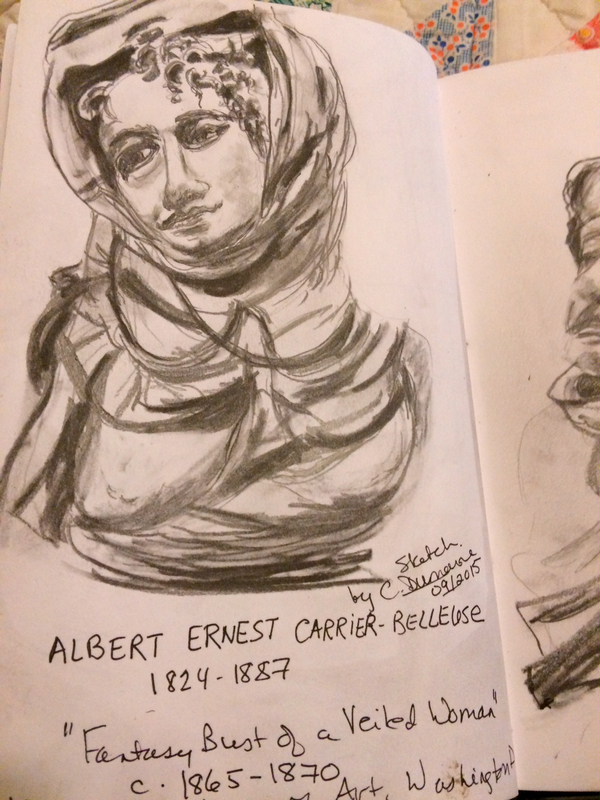 Cezanne’s sketchbook disclosed the opposite of today’s multi-tasking “monkey mind.” Page after delicate page, it reveals intense concentration on drawing heads, houses, hearth implements, and landscapes…in pencil mostly…and a single-minded focus which must naturally banish other concerns. (His other concerns were evident in lists and notes–possibly shopping lists, even– written on the inside flaps of the notebook, however.) These sketches are maps, and problem-solving schemes, in some cases for later studies in other media. In what other profession, do we first do “studies” for studies for, possibly eventually, some final product? 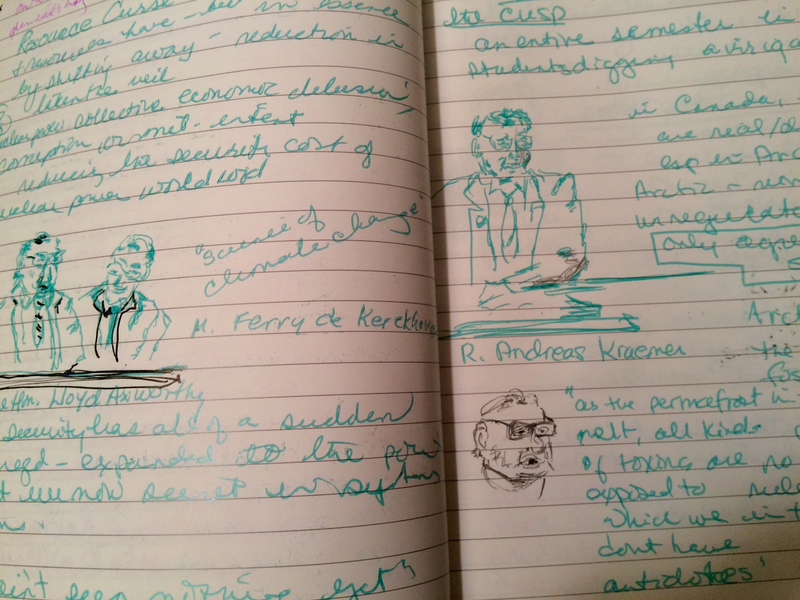 For the novice especially–but also the more experienced artist–there is much to learn from studying others’ works. Today, the whole day was spent on still life painting–which is not much time considering that some artists whose work we examined spent their entire lives painting still lifes. The approaches different artists take are more meaningful when we are taught to appreciate what is being done, or attempted, in a painting. It’s clear now that the humblest table setting, a piece of cake,or a half-full water glass, can–either alone or together–serve as props for an interesting painting. 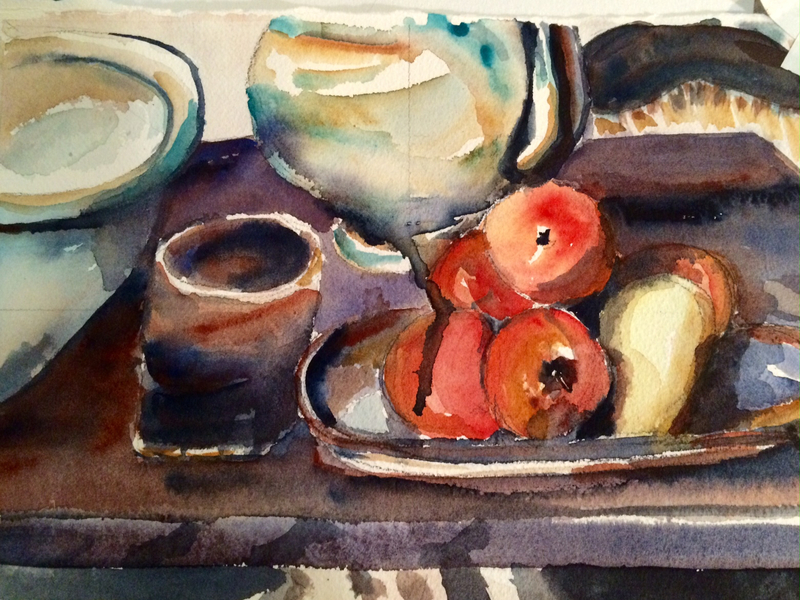 We saw still lifes from above, below, at eye-level, and at varying other angles, and noted how the “ellipse” at the lip of a jug, jar, bowl, or bottle would change, depending on the perspective. In addition, the “composition” of a painting was a subject of great scrutiny in this class–as were values, color complements and contrasts, and shapes. After such an intensive overview of still life painting through the ages, it will no longer be possible to glide thoughtlessly through galleries of still lifes in the museum, unimpressed by paintings of ceramic jugs, plucked fowl, and dead furry creatures adorning peasant tables. 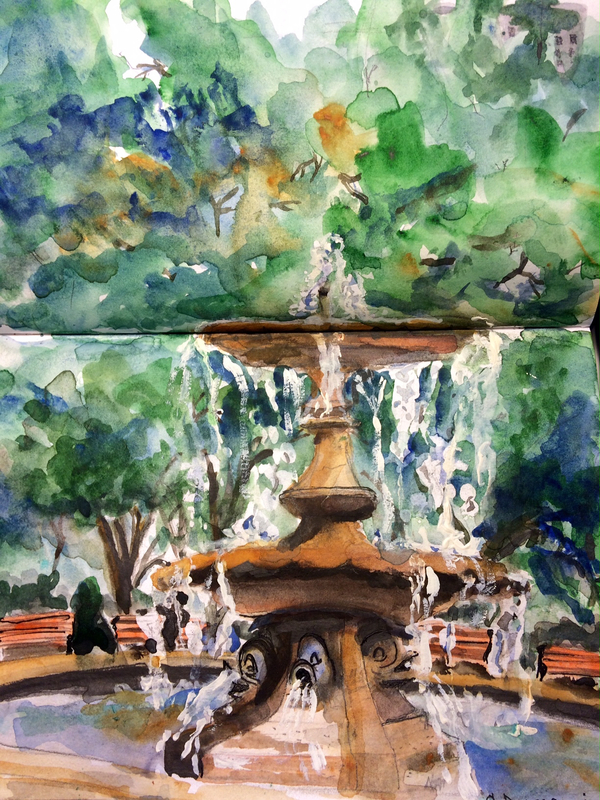 The same goes for “landscapes” which was yesterday’s focus, painting in “plein air” in the riverside gardens and meadows of an elegant 18th century Virginia estate which now serves as the headquarters of the American Horticultural Society. Little by little, we progress to a deeper understanding of what the “masters” in art were seeing, and trying to convey. In a group of similarly motivated people, it is possible to learn more quickly about different styles, insights, and experiences. What would a world without art look like? In a world of “bigger,” faster data and technologies, culture and cultural sensibility matter more than ever. This is because no amount of data can tell us what to do, or ensure that we will do anything as must be patently obvious by now. Determining the right thing to do, moreover, will take more than data. People can communicate through art across the boundaries of cultures and centuries, unless that art is irreparably destroyed. It will take excellent teachers (and excellent school systems supporting them)…and, perhaps, some high-powered magnifying glasses–to mainstream the insights of the world’s greatest artists and humanists into contemporary educational and organizational systems. What would this look like? Fortunately, in my school these days, students range in age from 6 to 80-somethings, all learning new things with gusto. In such an environment of human creativity, it is impossible not to be optimistic. At the Library of Congress’s Annual National Book Festival yesterday, held at the Washington Convention Center in Washington, D.C., the line of people to attend a nearly two-hour module featuring two of the festival’s featured authors, E.O.Wilson and Jeffrey Sachs, speaking on “Our Planet’s Future,” was SO LONG that no one could find its end, not even the event coordinators. Even though two adjoining rooms were made into one for this audience, it was clear that many of the people waiting to get in would not get in. Indeed, the time for the beginning of the program came and went as the event coordinators tried (unsuccessfully, it seemed) to determine where the front and the back of the line of people was. The “line” wrapped around itself in the crowded outer hall so many times that people were facing every which way and latecomers actually found themselves positioned by the entrance to the conference hall. I do not know what eventually happened–or, indeed, what the speakers had to say–as it would not be possible to get into the conference hall. 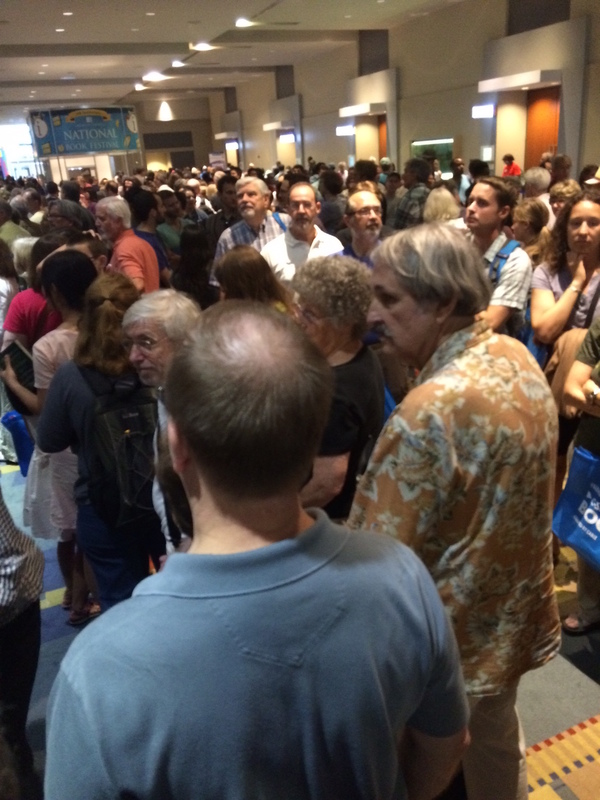 It was encouraging, however, to see such a multitude of people waiting to hear these two authors speak. And it was the name “Wilson” that one heard uttered most in the crowd. E.O. Wilson’s latest book has been discussed here on this blog many months ago and it was one of the titles on sale yesterday in the National Book Festival’s cavernous lower level, seemingly the size of three football fields. Seeing people so interested in hearing eminent thinkers on the fate of our planet has to be a good sign! And, so too, is the obvious commitment on the part of the reading public to consuming ideas, hard facts, and critical thinking, powerful trends to build upon in a positive way.